Well, this book was just delightful. After reading some heavier things lately, I was due a nice, sweet book. 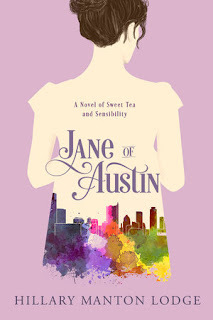 And, Jane of Austin: A Novel of Sweet Tea and Sensibility was the perfect book to curl up with and watch the day go by. I am a big fan of modern adaptations of the classics. When you can bring the plot and characters of Jane Austen into our world, I swoon. Seriously, Bridget Jones' Diary is my all-time favorite movie. So, it should come as no surprise that I was excited to read this modern adaptation with a clever title. 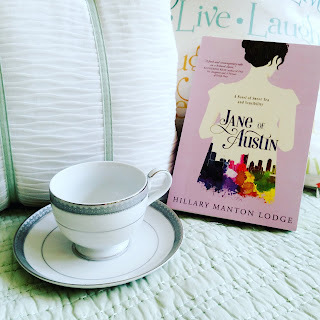 Jane of Austin is a modern take on Sense and Sensibility bringing sisters who have lost everything due to their father's poor choices on a move from San Francisco to Austin, Texas to run a tea salon. Tea, pretentious wealthy people, female quarreling, swarmy guys and romantic heroes - all the stuff Austen is made of. Plus, add in plenty of discussion about both tea and Texas and the novel delivers an entertaining and engaging plot. I loved the characters - another key Austen trait. I wanted to see them resolve conflicts and overcome obstacles. Taking the cues from Austen, the romantic hero is a true hero who readers will fall in love with. The sisters, Jane and Celia, are both women I could imagine being friends with. Of course, since you know Austen and you know standard romantic comedies, you will know how this novel ends from the first page. However, that does not make it any less enjoyable. I could not stop reading the novel because I was anxious for my happy ending. Sometimes you read a book and you just see a movie jump off the pages...well, this is one of those. I could easily imagine them turning this into a movie. Hallmark fans would eat it up. You may purchase this book from Amazon here on by clicking the picture. This affiliate link - thank you for supporting my blog!